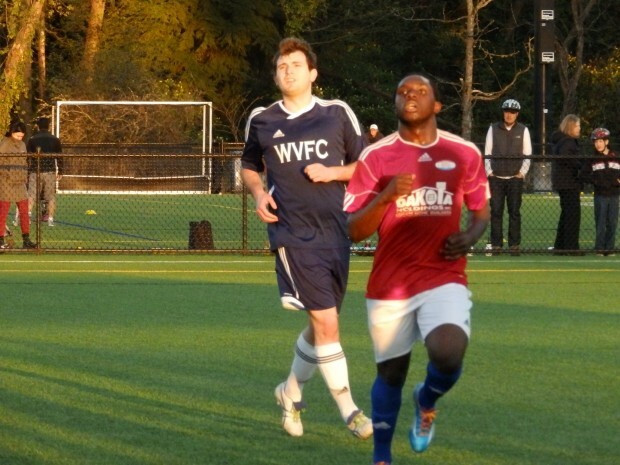 VMSL Champions West Van FC crashed out to a shock defeat in the BC Provincial Cup quarter finals on Friday evening. The home side fought back from being a goal down at the break to fellow VMSL side Croatia SC and took the game to extra time before going out 6-5 in a penalty shootout. It was a beautiful spring night for football and Croatia looked the better team in the first half, taking the game to their hosts. Croatia came close to opening the scoring in the 13th minute when Eddy Tsen crashed the ball off the left post after some good work in the box. The visitors kept pushing and got the breakthrough their play deserved when Taj Sangara was played in and he hit the bouncing ball first time into the bottom corner to give Croatia SC a 1-0 lead. The goal sparked some life into West Van and with ten minutes of the half remaining Cathal O’Connor forced Croatia keeper Simon Cohen into a save at his near post, with Jesse Fetterley blasting over the resultant corner. As in their first round match against CCBRT United, West Van went in at the half behind but came out for the second half all guns blazing. They nearly levelled proceedings just two minutes in when Corey Birza forced a great diving save out of Cohen from close range. Croatia hit back and immediately forced a save from West Van’s Marco Durante in return, from a Johnny Sulentic free kick. West Van were doing all the pressing, with Croatia seemingly happy to sit back, soak up the pressure and try and get something going on the break. After a couple of close calls, the visitor’s finally cracked when Devan Woolley rose above everyone to head an O’Connor free kick down and past a sprawling Cohen for the equaliser in the 64th minute. Desmond Tachie had a great chance to give West Van the lead with 20 minutes remaining when he did well to make room for himself in the six yard box before firing his shot straight at Cohen, who turned the ball around for a corner. The game started to turn a bit chippy but it was looking like there was only going to be one winner and that was the home side. Robert Giezen had a great chance to win it for West Van with eight minutes remaining but he fired over and the game headed into extra time. Croatia started to refind their attacking play and came back into the game in an extra time period that was devoid of any real clear cut chances to win the match. With a minute of extra time remaining though, Birza nearly grabbed his second of the night and a West Van winner, but his fierce drive from the edge of the box was tipped over by Cohen. Penalties would now decide it. Each side buried their first five and with sudden death now in play, substitute Nico Espinosa sent Durante the wrong way and hit it coolly into the bottom left hand corner for Croatia. Tachie was next up for West Van and hit the ball to Cohen’s left. The Croatia keeper went the right way to save and sent the visitors into the semi finals where they will travel to take on the winners of the Inter FC – Westcoast Selects quarter final being played on Saturday afternoon. In the B Cup quarter final played on Friday night, defending champions Richmond All Blacks dismantled Surrey Temple United 5-1 and move into the semi finals, where they will travel to face the winners of Sunday night’s game between Burnaby side Europa FC and VMSL side Metropolitan FC.